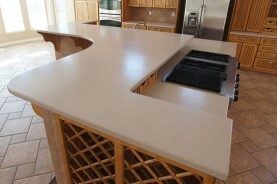 Solid Surface Countertops – Are you looking to install Corian or Silestone countertops? Kitchen counters can be made out of a variety of materials including granite, concrete, tile, wood, and laminates, such as Formica®. In addition, relatively new technology has led to the development of engineered or synthetic composite materials like Dupont’s Corian®, Silestone®, and Swanstone™. These man-made materials make great countertops, but they are an expensive option when considering them to replace a laminate or tile countertop. If you’re considering installation of Corian®, Silestone®, or another solid surface, also consider the time, cost and repair advantages of countertop refinishing by Miracle Method. Solid Surface Countertops – What are they? A solid surface countertop refers to any type of kitchen countertop that is installed to give the appearance of a single material. Granite countertops and engineered countertop surfaces like Corian®, Silestone®, and Swanstone are popular, but expensive to buy and install. Miracle Method’s Natural Accents™ provides a similar stone solid surface look at a fraction of the cost, and unlike these products has greater color options and is repairable. Natural Accents™ surfaces are ideal for kitchen countertops, sinks, tub surrounds, vanities, and showers. 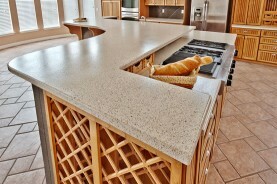 Solid Surface Countertops - What are the advantages of refinishing countertops? Solid surface and engineered stone countertops have certain advantages and disadvantages. Solid Surface Countertops - How do I find a professional refinisher? Refinishing is almost always more affordable, quicker, and easier than removal and replacement. Click on Find a Location or call our toll free locator number, 1-888-271-7690, to find the Miracle Method office closest to you and request a free estimate.